Make a Recycle Bin in your USB Pendrive. | Kanishk's Technical Blog. Make a Recycle Bin in your USB Pendrive. Hello, Here is a Trick that I am posting today "Make a Recycle Bin in your USB Pendrive." Yes,its possible. After Learning this Trick you are sure to have a Recycle Bin in your USB Drive. Why do I need a Recycle Bin in my USB Drive? While working on another computer and using your own Flash Drive as a place to store and copy files, if a file is deleted it's sent to the Windows Recycle Bin or Permanently Deleted. 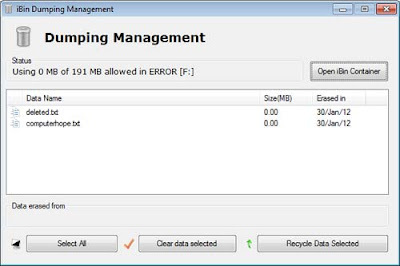 If you'd like the extra security and peace of mind, use the iBin utility to have all deleted files sent to a Recycle Bin folder on the Flash Drive. 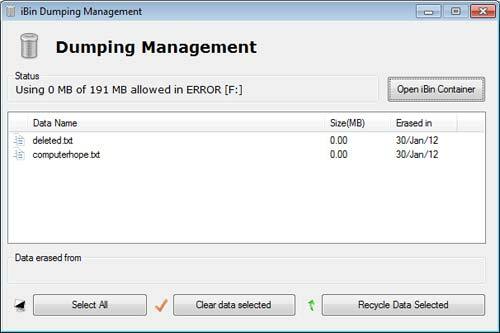 Just Follow the Below Steps to make a Recycle Bin on your USB Drive. 1. Download the iBin From Here. Here is what the Software Would Look Like on Opening. I advise you to Read the Disclaimer.txt and User Guide carefully before Using this Software. Note: If you're installing this utility on a Flash Drive with several thousand files or a drive with several GB of data it may take a few minutes to index the drive and its contents the first time it is ran. I Hope You Like this Software.